338 pages | 34 B/W Illus. Sustainability is a global issue that urgently needs addressing, and for which the most serious consequences are for children and future generations. This insightful research text tackles one of the most significant contemporary issues of our times – the nexus between society and environment – and how early childhood education can contribute to sustainable living. By offering international and multidisciplinary research perspectives on Early Childhood Education for Sustainability, each chapter explores and investigates the complex topic of sustainability and its relationship to early childhood education. A particular emphasis that runs through this text is young children as empowered citizens, capable of both contributing to and creating change for sustainability. The chapter authors work from, or are aligned with, a transformative education paradigm that suggests the socio-constructivist frameworks currently underpinning Early Childhood Education require reframing in light of the social transformations necessary to address humanity’s unsustainable, unjust and unhealthy living patterns. 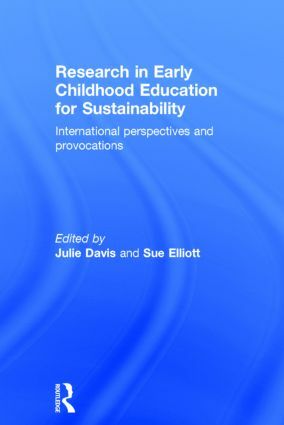 This research text is designed to be provocative and challenging; in so doing it seeks to encourage exploration of current understandings about Early Childhood Education for Sustainability, offers new dimensions for more deeply informed practice, and proposes avenues for further research in this field.